Our plus size boyfriend jeans are selling out quickly. Grab them before they're gone! With plus size boyfriend jeans from Old Navy, you don't have to have a boyfriend to get the comfortable fit and casual look you love in a plus size boyfriend jean. Inspired by the look and feel of men's denim designs which have been perfectly worn-in, the boyfriend jean is a stylish fashion choice. Our plus size boyfriend jeans for women can be paired with a graphic tee and sneakers for a casual day in the park, or amped up with pumps and flashy jewelry for a night out on the town. 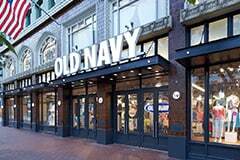 With women's plus size boyfriend jeans from Old Navy, you will be comfortable and fashionable for any occasion. Plus, with our affordable prices, you can purchase multiple styles to vamp up your wardrobe all year long.